Sustainability means living in accordance with the natural system of our planet, without causing any harm to the environment and all other living beings that belong in it. Because of the growing number of people who want to create environment-friendly homes, the production and demand of green flooring solutions is on the rise. When talking about sustainable flooring solutions, vinyl is a flooring option that comfortably takes the number one position and with a very good reason. Its features make it suitable for light or heavy commercial and residential use all while being extremely easy to maintain. What makes vinyl one of the most popular sustainable flooring options is its durability, flexibility, functionality and performance. Thanks to the latest innovations in the manufacturing process, vinyl has a low environmental impact and amazing performance features within a multitude of uses and affordable price tags. It comes with high durability, meaning you will be save from short-term replacements. Its low maintenance characteristic means you do not need any energy-intensive cleaning and the usage of harsh chemicals is significantly reduced to a minimum. All you need to have you vinyl sparkling like new is water and mild detergent. In addition, vinyl is 100% recyclable and can go through this process many times without losing any of its performance properties. It is the most thoroughly tested and researched material, meeting all safety and health standards. 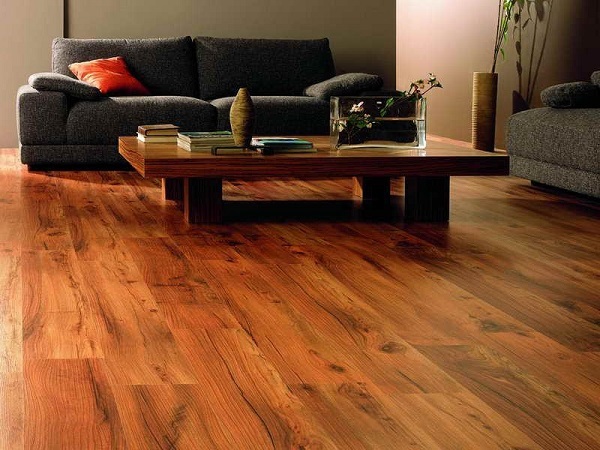 Vinyl flooring is also flame retardant because of the chlorine content in its composition and when removed from the fire, it extinguishes itself. Also, it features high resistance for underfoot safety and low volatile organic compound (VOC) emissions. What makes vinyl environmentally friendly flooring choice is its structure – it’s made of 57% salt (chlorine) and 43% oil (ethylene). Chlorine is a substance that takes huge and important part in the world of nature. Many things in nature contain and produce some quantities of chlorine molecules, including the animals, plants and sea water itself. It is commonly used in the health industry as well. 85% of medicines available on the market contain chlorine in their composition or use choline during the process of production. Ethylene is a natural product used for plastic products and its usage is only 4% globally and the vinyl flooring uses just a tiny part of this percent. Vinyl is made of 85% sustainable materials including calcium carbonate filler. The unique structure of vinyl means this flooring option is extremely durable and practical and has more than 20 years of life span. During the process of production, this flooring passes through softening that makes is versatile and flexible. So if you are looking for something versatile, durable, easy to care and moreover, safe, vinyl is the right way to go with.